Hi, I am putting up this profile on behalf of my daughter. 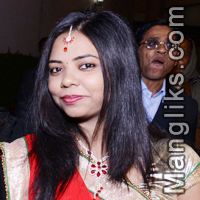 She is working with Ketchum Sampark as Sr. Account Executive in Mumbai . She has done her Masters from Pune. We hail from Mp Gwalior. Her mother is a homemaker, father is employed, and has * sisters, * of who is married. Her friends describe her as Affectionate, Caring, Easy-Going, Hard Working and Sweet. Her hobbies include Cooking, Dancing and Singing.